Come down to Victoria and browse through a great selection of music of various genres ( Rock, Jazz, Blues, Punk, Metal, Folk,Pop, Electronic etc). Mostly LP's but there will also be 45's, CD's, Concert DVds etc. For more information (including table rentals) please email or phone 250-532-0124. We look forward to seeing the music lovers who have been waiting patiently for another record show in Victoria. 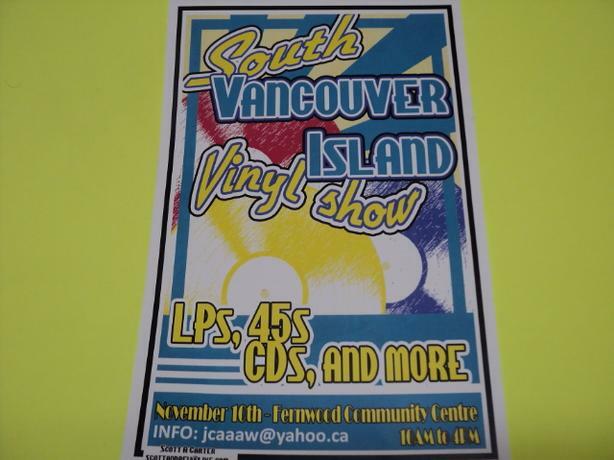 The Fernwood Community Centre will be the place to be on Saturday November 10th from 10 to 4. 1240 Gladstone Avenue.